Dining options on Loyola’s campus have recently expanded with the Danna Center food court, but are you aware of the many other options available? We have seen the long lines to grab an entree, red bean Mondays, catfish Fridays, vegetarian options, and styrofoam dishes. Everyone that lives on campus has probably eaten here. You can love the food or hate the food, but the OR has a variety of options to accommodate all Loyola and Tulane students. This location is hidden in the basement of the Danna Student Center. It provides a quick option for anyone looking for a salad, sandwich, fruit, and a bag of chips. It can all be yours with a meal plan swipe. Real fruit, real fruit, real fruit is always enough to hook me. At Smoothie King, drinks are blended in a variety of combinations for any student looking to enjoy a smoothie or supplement their diet. I would recommend visiting this location after a workout or on your way to class. I can always find a late night snack and variety at The Market. Sometimes I am frustrated with the prices, but the convenience cannot be matched. The Market sells more than food. Items include everything from laundry detergent to paper towels and tissue. This place can be a great stop if you are looking for a classic burger to enjoy. I have had the veggie burger, and it is something to write home about. The OBC has many options to choose rather than exclusively serving hamburgers. Late nights? Early mornings? Daytime stress relief? The solution can usually be found at CC’s coffee stand in the Danna Center. I am not the biggest fan of coffee, but I enjoy the friendly staff members and my favorite item is the blueberry muffins. Panini’s, fresh soup, and gelato on your mind? Check out La Divina to enjoy an Italian cuisine with fresh ingredients. With the reopening of Cabra Hall, students can enjoy the convenience of the fair-trade coffee establishment. Snacks and outdoor seating is available for students to enjoy the selection of treats at the café and bakery. 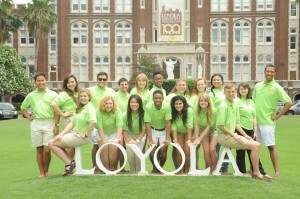 What is your favorite place to eat at Loyola? Every exam, every class, every year… I always have questions to ask. From what type of exam to how many questions to where did the time go? Midterm exams vary by majors and professors. As a Mass Communication major, midterms are usually in the form of a project. As a Political Science major, midterms come in the form of written tests or papers. Through my experience in common curriculum courses, the type of exam can be anywhere across the board from papers to no assignment at all. would study based on the format of the exam and the type of content. However, I quickly have found out that different does not necessarily mean better. In my experiences, the amount of effort and work a student has contributed to the course will outweigh any type of examination. Timing was another question that often crossed my mind. Some of my midterms were scheduled two weeks before other midterm assignments. I became caught up in the details of the exams rather than seeing the bigger picture. I am shocked that the Fall 2013 is halfway gone. Fall 2013 started my junior year in college, and I have used my midterms to push me and motivate my mind to finish the semester strong. This set of midterm examinations has allowed me to reflect on my college experience and my test taking strengths. Junior year: the halfway point of college, only began to sink in after I completed these exams. The feeling can be overwhelming or motivating, the choice is yours. However, both choices take the same amount of effort. I still have many questions to ask, but I believe the purpose of midterms is to motivate. Once, I began to embrace this technique, I was able to see the bigger picture. So I ask you: What is your most difficult midterm exam this semester and how will you allow this exam to motivate you? Family Weekend 2011 was timed perfectly for me. 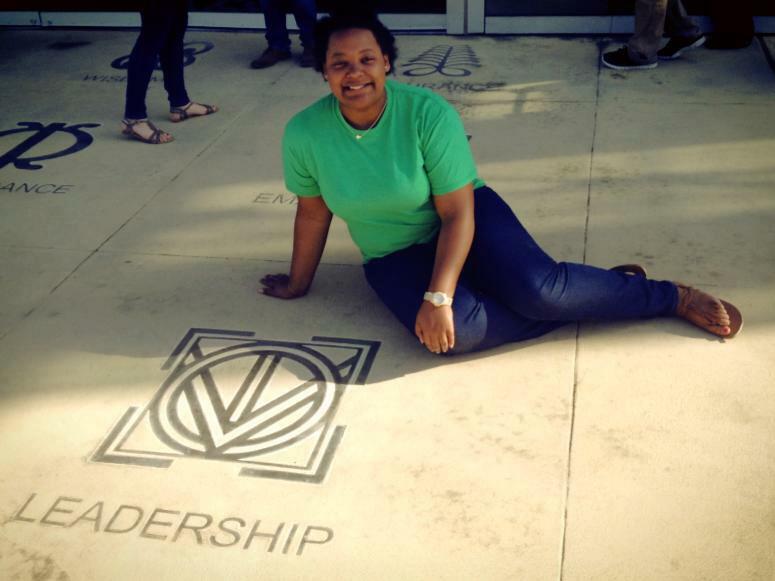 I had settled into my residence hall, and I was comfortable with my class schedule. I finally felt like a college student. Because I am from Illinois, my parents were unable to make the events of the weekend, but a close family friend was able to be my surrogate family member for the events. The weekend began with registration and a Family Weekend t-shirt. My favorite event of the weekend was the tour of the city. We went through a cemetery and saw elevated graves, and throughout the tour many parts of the city were pointed out in excitement, but our tour guide discussed Hurricane Katrina on numerous occasions. A great quote I took away from the tour was trust that in New Orleans there is always has a reason to celebrate. Family Weekend 2012 rolled around, and I had told my parents this weekend was exclusively reserved for first year students and their parents. To my surprise, I saw upperclassmen students partaking in the family weekend events. I was so jealous and wished that my family had come! 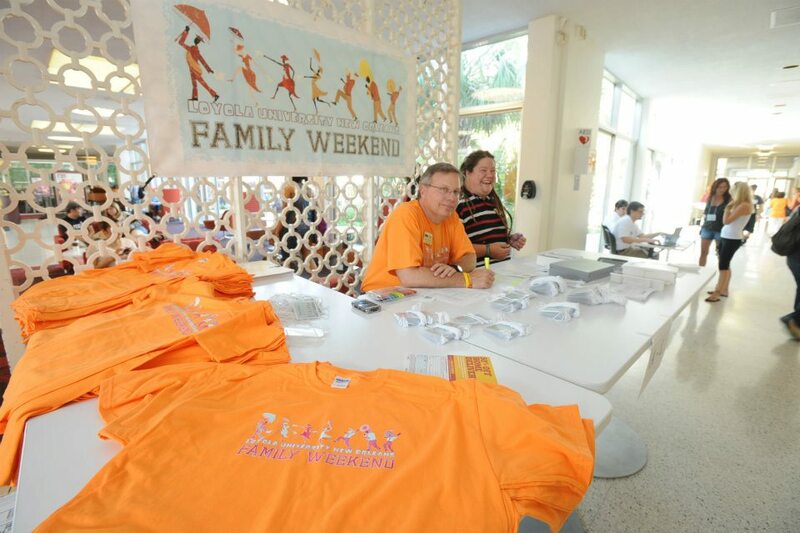 Family Weekend sticks out in my head as a highlight of my freshman year… and my family friend still wears his orange t-shirt. What memories will you create on Family Weekend? Attention first-year students: You have done it! 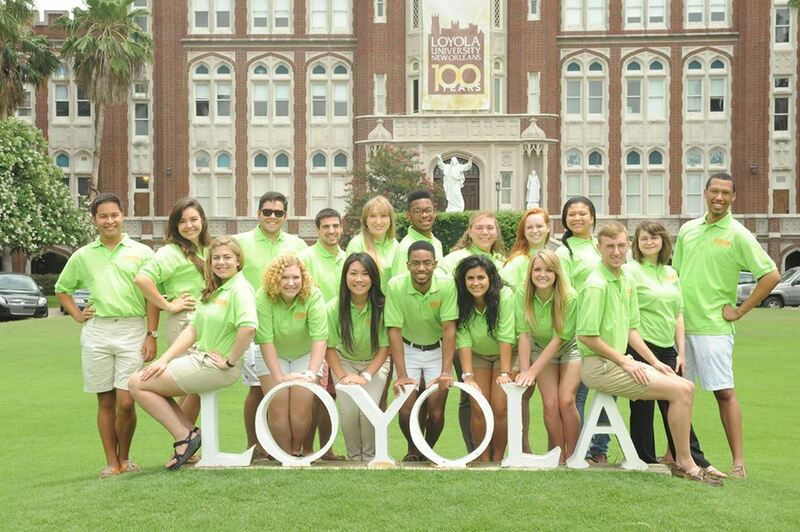 You have officially started your first semester of college and on behalf of Residential Life, we are so happy and appreciative that you have chosen Loyola University New Orleans! In addition to beginning our 4th week of classes, we are also beginning our 5th week of the PACKport program series for first-year students. As may already know, this series was developed to help you find connections at Loyola and to support your academic goals as a first-year student. Many of you have already attended the programs including late night events, faculty discussions and workshops, careers development opportunities, wellness events and many more! and are helping you connect to our thriving campus. Not to mention you earn points for every event attended! If you have not gotten the chance to attend any PACKport sponsored, we have 9 events remaining and are certain you can find something of interest and help to you! Grab your roommate, a friend, your Resident Assistant and catch a few more before the program ends on September 26 with the grand finale, Splatter Ball and the Silent Auction. Splatterball is dodge ball with a twist, where you will get the opportunity to spatter yourself and your friends with a rainbow of paint! We will also host the silent auction at this time where you can use your PACKport earned points to bid on prizes such as airline vouchers, movie packages, New Orleans excursions and more! Don’t let Splatterball be the only PACKport event you attend, see the full list below and take some time to stop by! 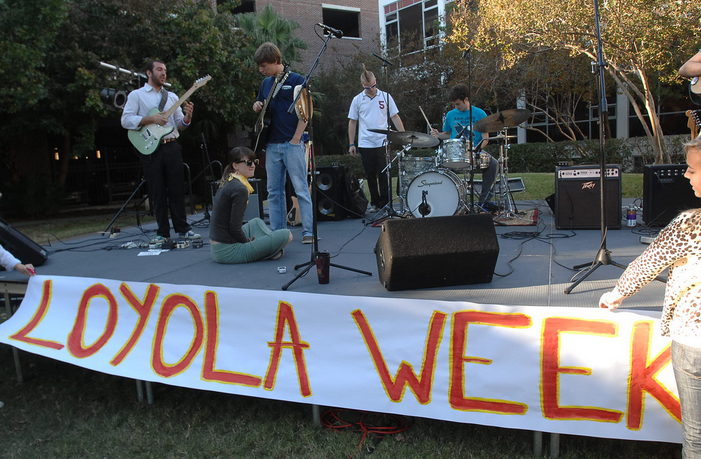 Events can also be found in OrgSync, loyno.edu/packport, and on the University calendar. 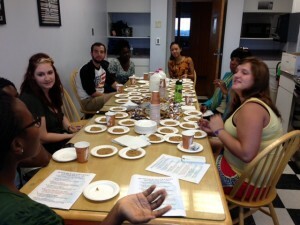 Returning student Chris Backes writes a blog for us this week about transitions. He attended Loyola for two years, spent two years as a Jesuit novice, and now returns to Loyola to complete his degree. 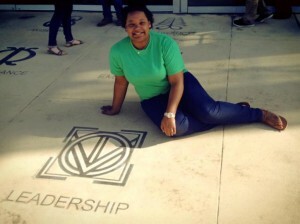 “I have made a lot of transitions in my life: going to high school, going to college, leaving college and going into the seminary, and then leaving seminary and going back to college. Transitions aren’t easy. And I know I am not the only one. My class, the class that I was in before joining the Jesuits, I just graduated and my friends all have similar transitions coming up: moving to a new place, living a different lifestyle. Throughout my times of transition, I have noticed that transitions tend to resemble the seasons. Fall begins by the life slowly appearing bleaker. The prospect of moving way and beginning something new can be frightening, especially when we can’t know what’s coming. Going to college where you know no one or moving to a new city without having a decent job; both make the transition hard. Winter creeps along and things can seem desolate. Old friends are hard to keep in contact with, or maybe you are struggling to get by. New friends are not always easy. At this time we tend to have moments of desolation: when the comforts of love offered by those around us are all to absent. But then, spring catches us almost by surprise: Life begins to get easier. New friends are made, classes might not seem so daunting anymore, and work is finally paying the bills. Consolation, the love and support we need from those around us, begins to take hold of our lives. 1. Have hope. It makes the winter shorter, even non-existent. Hope is what allows us to continue on through the difficult times.